Jordan Mailata’s journey from rugby to the Eagles surprised everyone. Especially his family. Rugby is a family affair for the Mailatas. 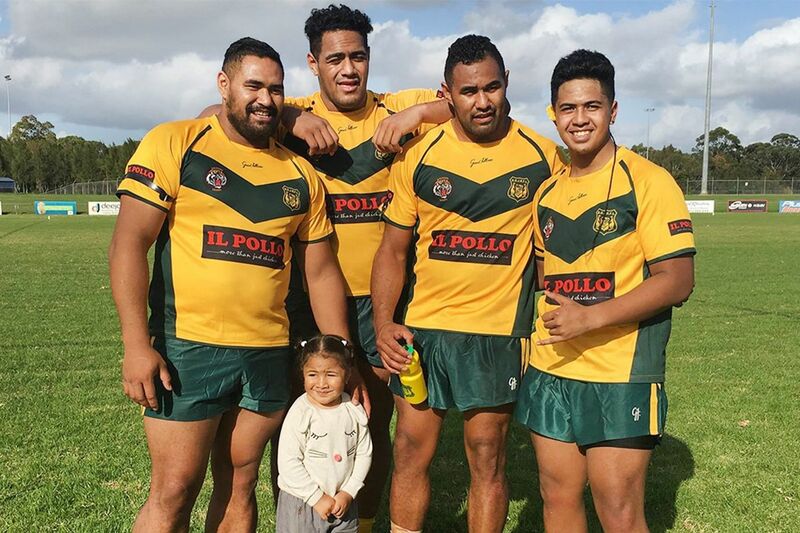 Jordan (second from left) poses with his brothers in 2016 while the crew was playing for a local rugby club. From left to right: Daniel, Jordan, Moana and Oshan, a family friend. Also featured is Jordan’s niece, Eraia. SYDNEY, Australia — To his family, all the rest of them, the NFL meant bright lights so far off in the distance they could have been stars in the sky. Jordan Mailata made his case to the whole clan how the NFL really might be the sport for his 6-foot-7, 300-plus-pound self. Nobody else could see it. To his parents, his three brothers and a sister, and their various partners, all sitting there in Bankstown, a suburb southwest of Sydney, rugby was the sport. Their family produced rugby players. The kid was the best of them, a breath from the big time, one break from Australia's top tier, the National Rugby League. Could Jordan Mailata be the Eagles’ starting left tackle in 2019? After all the work Jordan had put in — all those steps he climbed in Coogee to drop weight, the predawn wake-ups to go work on a demolition crew before practice, coming back from the heart procedures — now he was going to fly off to chase the bright lights? They actually asked him: Had he been blinded by those lights? "I got knocked out,'' Mailata said with a laugh, remembering the family debate, Part I, him against all, nobody on his side. The end of the discussion meant the discussion was ended. Last month, Jordan's oldest brother, Moana, sat in his own living room in Coogee Beach, a seaside enclave on the southern outskirts of Sydney, encouraged by Jordan to tell the tale that now has been updated with the kid brother, age 21, on the roster of the Philadelphia Eagles, not playing yet but his future at offensive tackle seemingly unlimited, bright lights suddenly in focus, even back home. Moana and his fiancee, Jo Doran, took a ride over to the rugby field used by the South Sydney Rabbitohs, which has bleachers on one side and kind of doubles as a town park in the offseason. Think of a small-college football stadium. You can imagine why Mailata reported back that the first Eagles game at the Linc was the greatest day of his life. The family has caught all the reports, how NFL analyst Brian Baldinger heaped praise on his technique and his "violent hands" in the preseason, how another former NFL player, Ross Tucker, called him a future all-pro before he ever played a regular-season game, which he still hasn't done. The family sees it all, how the Eagles put him on the regular-season roster to avoid the risk of losing him, how reporters have suggested everyone slow down on the hype until Jordan Mailata actually gets in meaningful games. That's all getting ahead of things. "I don't know how to begin the story,'' Mo Mailata said in his living room. "It is insane to think how far he has come." >> READ MORE: Could Jordan Mailata be the Eagles' starting left tackle in 2019? Jordan Mailata signing autographs before the Eagles’ game against the Vikings. Mailata has been active for only one Eagles game, but he’s still a fan favorite. Thinking about a tale that now spans four countries over two generations, and this sport that his little brother picked up out of thin air, Mo held his hands about eight inches apart — "amazing." Then Mo spread his arms wide. "Really, it's that big," Mo said. Mo began explaining how this time last year, Jordan had just finished his rugby season, but NFL fans might be surprised to find out the 2018 seventh-round draft choice of the Super Bowl champions was no rugby star. Jordan played for the second unit of the Rabbitohs. What that really meant, Mo said, was that Jordan earned his keep by waking up most mornings at 5 in time to join a work crew that specialized in high-end demolition. After, he'd catch a bus to the training ground for the Rabbitohs, where he began last season not even making the second-grade game squad. It was a big milestone when he got in the car after practice and told his brother, "I made the list." Getting in a game happened soon after. Jordan received a little game stipend but no real salary from the Bunnies, as the Rabbitohs are known. He was just getting a chance for some top-grade National Rugby League coach to see him and figure out what to do with the largest rugby player anyone could recall. At the time, Mo Mailata said, NFL — as they called American football, to differentiate from Rules Football and soccer and rugby — meant a game they fooled around with on PlayStation, with almost no understanding of the actual rules. "Nothing but Hail Marys," Mo said of the play calls he and Jordan and the others would repeatedly go for. "First down, Hail Mary! Second down, Hail Mary!" Put on a rugby video and Mo starts explaining nuances, set-ups that lead to scores, timing that has to be exact or the whole play falls apart. He also showed his younger brother hitting people with a ferocity that transcends sporting codes, how for all his size, Jordan was rarely caught flat-footed. "He had a nice stiff arm,'' Mo said. "Wicked." Fitness was the issue. The action rarely stopped. Jordan would be asked to stay after practice for extra work. "He didn't moan or groan,'' said Beau Cordtz, a teammate on the Rabbitohs who described his friend as a "just a big athlete, agile, so strong. Ran side to side." Also, Cordtz said, "well-mannered, a gentle giant." As Jordan became comfortable thinking of himself as a situational rugby player, his coach came up with situations to use him. "That's very, very creative.' "
If opponents could hear it and figure out what was coming at them, good luck to them. "The play was really thought out, with underlines and overlines,'' Mo Mailata said, breaking into rugby speak. "If his timing was off, it wouldn't work. With big guys, there's that concern." He found video of the play, Jordan lined up deeper than an NFL tailback, almost like a punter, before the play unfolded and ended with Jordan scoring after a no-nonsense stiff arm. Asked what he misses about rugby, Jordan said, "Honestly, I miss running the ball. I miss tackling. I miss hitting people. Man, I miss hitting people." Obviously, an offensive tackle collides with the man in front of him about every play, but that's from six inches away. "Full steam ahead, especially when you time it up right,'' Mailata said. "I miss it. But I love this sport. This [football] is the ultimate team sport, I don't care what anyone says. I wanted more." If his family saw his progress in rugby as a sign of his potential, they didn't show it. Cordtz recalled Mailata calling him one night after the big family NFL discussion, Part I. Jordan was emotional, explaining how nobody wanted him to go try this three-month developmental program in Florida. Beau gave his own advice: "You should go, mate. Drop everything. For this one moment, be selfish." Explaining how it wasn't that simple, Mailata said, "I had to ask for permission. In Samoan tradition, if you're not married yet, you have to do everything your parents say. And even if you are married, you still have to go by what your parents say." As for his own advice to Jordan to stick with rugby, Mo Mailata said, "It was all so selfish. That was just me being selfish. Everyone wanted to challenge him, to make sure he was doing it for the right reasons." Selfish wasn't the right word. The family members just saw so much in their brother. Mo and Daniel and Jordan had played on the same club team. At 6-foot-4, Mo looks like a handful on the rugby field. Daniel is an inch taller. Jordan, two inches more, was the gifted one, they all said. Was he sick of the work required in rugby? Was he bored with it? Jordan himself explained how Mo and Jo — he just calls them MoJo — had saved him, offering a place to live and a restart when his rugby career had grown stagnant and life at home had grown frustrating for a 20-year-old, Dad's rugby advice a little tiresome, the commute too long. "We're not millionaires, but there's the beach,'' Mo remembered telling his brother. Jordan Mailata (center) went to live with his brother, Mo, and Mo’s partner Jo, in Coogee Beach. Imagine Sydney as Los Angeles and Coogee Beach as Manhattan or Huntington Beach, you've got it about right. Mo and Jo live about a 10-minute walk uphill from the beach. Coogee Bay spills out to the Tasman Sea, which is really the South Pacific. "They were my lifeline,'' Jordan said. "I reached the point, I was just plateaued. Living with my mum and dad. I couldn't drop the weight. I wasn't getting any game time. I almost pulled the pin. I almost pulled the pin on rugby. MoJo saved me. They said, 'Why don't you move in with us? We'll get you straight.' "
"No matter what it is, he's good at taking instruction," Jo Doran said. "Basically, she'd tell him, 'Before I come home, I want you to clean the dishes and take out the rubbish,' " Mo said. "He'd clean the dishes and take out the rubbish. Now, not the recycling." "No new [trash] bag,'' Jo said, since she hadn't mentioned that either. They were having fun giving him the business from halfway around the world, but both talked of Jordan as special to them. Mo said, "Growing up, he was always the kindest, the warmest. He's got the good part of us." Their parents were both born in Samoa, which is a different island from American Samoa, home to so many NFL players. In Western Samoa, as Samoa used to be known, the natural immigration path is west to New Zealand. That's how it worked for their parents. The Mailatas. From left: Daniel, Sese, mother Pereseti, father Tupai, Jordan, and Millo. Tupai Taamilo Mailata was born into a farming family in Samoa. Of course, most families were farming families in Samoa. As Mo described the life there as he understood it, there was no oven. Food was cooked in the ground, "fire and wood." You'd tend the cows, tend the horses, look after the crops, such as taro, a root vegetable. "My dad was a proper farmer,'' Mo said, adding that his father moved to New Zealand when he was 19. There, "he was a mechanic, a carpenter, an electrician. He was a handyman. My dad did everything. On my birth certificate, it says handyman." "If you listened to him, you'd have thought he coached the All Blacks or something,'' Mo said, referring to New Zealand's storied national rugby squad. Mo was born in New Zealand, but Jordan is an Australia native. What caused that move? "There's a family story behind that,'' Mo said. "My cousin ran away from New Zealand. My dad's sister said, "Go find her.' My dad, a handyman, right? He should have private investigator [listed] as well. He found her." Plot twist: She stayed in Australia. He liked Australia so much he stayed too, sending for his own family. So Jordan and his younger brother, Millo, are the Aussies. "I don't know what I am, a bit mixed up — I guess I'm a Kiwi,'' Mo said. The parents always worked. Dad did everything he'd done in New Zealand, then grabbed moonlight shifts as a security guard. Their mother, Pereseti, or Maria, cleaned hotel rooms. Still does. Their oldest sibling, Sese, more or less raised the boys. Jordan Mailata (left) got his first taste of American football when he joined the Eagles this summer. There was another reason rugby hadn't been a steady climb: A medical condition hit Jordan when he was 17 and pulled him clear away from the sport for over a year, which knocked him off the top rugby track. He had two heart ablations "to burn out the extra pocket in my heart. It was causing me to have palpitations and I had no idea. I thought it was just me and my big body being unfit, being unaccustomed to the running style of rugby." He started back with the local team in Bankstown, playing with his brothers, which was a blast. "I ended up having real good year, turned some heads, raised some eyebrows,'' Jordan said. As the 2017 season progressed, he said, "It was hard because I was only going in in 10-minute spurts. So it was kind of hard to get a grip on who you are as a player, or how you're going to impact the team. "So they're how I decided to go about it, to accept that I was going to be an impact player and I was only going to be in for 10 minutes. And that was going to be my game. Once I accepted that that was a fact, my game started improving a lot. It was only coming to terms with what I was going to stand for, how long I was going to play for, what kind of impact I was going to have on the team." It was almost as if he was describing the impact he could have on a sport he'd never played. He'd had small rugby offers the year before but decided the make-your-own-way deal with the Rabbitohs was the best for him. His new agency talked about possibilities, including playing rugby in Japan, or maybe in Europe. His agents also brought up the NFL, since every football fan who has ever seen Mailata has told him he should be a tight end or an offensive tackle. At the first mention from his agent, he said, he told them to put that at the bottom of the list. The top domestic offer after last season was for about $8,000 plus a $500-per-game stipend, he said, which meant he'd be back to demolition work when his big goal was to devote himself full-time to his sport — whichever sport. It was in Los Angeles, a few days of learning the sport and going through a combine, where American football took hold. The program in Florida called for six internationals, with four of them guaranteed a practice-squad spot for an AFC North team. He just had to talk his parents into letting him go. "My old man is very stone-headed, very stubborn, an old-fashioned man,'' Jordan said. "Sometimes it's hard to get a point across to him, but at the end of the day we know he cares; he's a softie." Two weeks after he'd been shot down, Jordan tried again. His father asked what he wanted to do with his life. He saw that question as an opportunity. First, he said, let's play some table tennis. After about five games, his father said he was going to bed. Jordan followed him upstairs, said he wanted to talk to him. "It's about me and America, wanting to play American football." His father stayed silent. Jordan saw him grab his head. "He was like, 'Go get your mother.' "
Jordan admitted his own heart started beating faster. His mother had fallen asleep on the couch watching television. He woke her up, said Dad wanted to talk about something. His father had told him earlier that he had to do something with his life. "I kind of used that against him,'' Jordan said. "I have something I want to do. This is what I'm choosing to do. It may not be the right thing, but how do we know it's the wrong thing?" Growing up, Jordan had always hung around a varied group of students. Nerds, he said. He's a nerd, too. The Lord of the Rings movies are his favorite, then Star Wars. He never followed something just because it was trendy. He had close friends from Indonesia and Vietnam, and a big Greek guy. Sometimes other Samoans called him a plastic Samoan, he said, for widening his circle. He just charted his own course. This was no different. "I backed myself that night," he said. He explained to his parents there was nothing else he wanted to do. "Then give this a go," he remembered his father finally saying. And now? Jordan calls his big brother and explains some play they're working on in practice. Was it good or bad? In trying to figure that out, Mo said he will ask his brother questions like, "So how does that make you feel?" Dad simply watches Eagles games now trying to get a glimpse of his son on the sidelines. Mo asked if he understood this crazy game, and their father started to give an answer but stopped, just started laughing. During the preseason, he did have one question: Why don't they just give his boy the ball?